TetV infected Tetraselmis. Arrow indicates virus particle. Inset, single particle. Image credit. 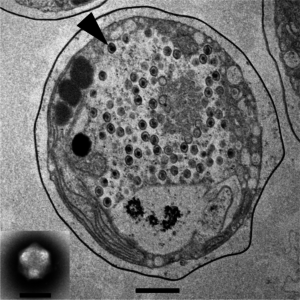 The latest giant virus discovery is Tetraselmis virus 1, which infects green algae. It is unusual because it encodes enzymes involved in fermentation. Green beer, anyone? TetV was isolated from seawater off the coast of the Hawaiian island Oahu, and was found to infect the green algae Tetraselmis. Members of this species are found in nutrient-rich marine and fresh waters. As they are photosynthetic organisms, their habitat is limited to the photic zone – the waters that receive sunlight. The virus particles are 226-257 nm in diameter and house a circular, double-stranded DNA genome of 668,031 base pairs. Phylogenetic analysis places TetV in the Mimiviridae. The genome sequence has 663 predicted open reading frames, of which 435 (67%) show no sequence similarity to known proteins. Four of the recognizable proteins encoded by the TetV genome have never been found in other viruses. Two are pyruvate formate-lyase and pyruvate formate-lyase activating enzyme. These are key members of cellular fermentation pathways, which allow energy production when no oxygen is available. Green algae may use fermentation in waters depleted of oxygen by exuberant algal growth. If this process occurs in cells, why does the viral genome have some of the genes involved? The answer is not known, but it is possible that the extra metabolic demands placed on cells during virus replication – especially at night – require additional fermentation enzymes for energy production. The other unique protein encoded in the TetV genome is alpha-galactosidase, which removes galactose sugars from glycolipids and glycoproteins. The authors speculate that this enzyme might be needed to break down the cell wall of Tetraselmis to allow new virus particles to exit. The fourth unique gene encodes mannitol 2-dehydrogenase, which can convert the carbon storage compound mannitol into fructose and vice-versa. Perhaps viral production of this enzyme also aids in releasing new virus particles, by leading to overproduction of mannitol, hypotonic shock, and cell lysis. The presence of these novel genes suggest that TetV can change host metabolism, perhaps facilitating its replication. While not a new idea, certainly the TetV genes are unique. Additional experiments are needed to show that these proteins are produced, under what growth conditions, and their consequences for cell metabolism.